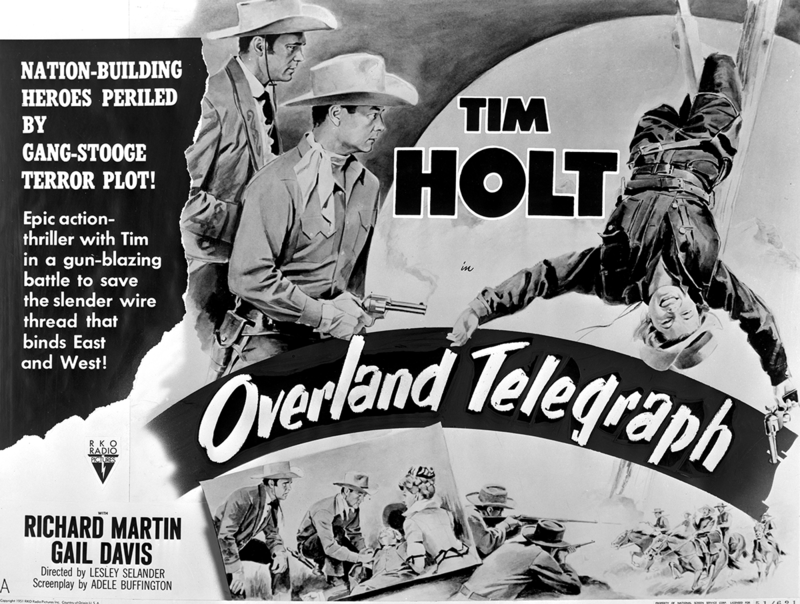 Tim Holt Tuesday #8: Overland Telegraph (1951). | 50 Westerns From The 50s. 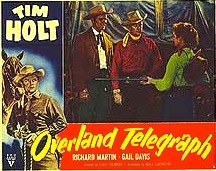 Tim Holt Tuesday #8: Overland Telegraph (1951). CAST: Tim Holt (Tim Holt), Richard Martin (Chito Jose Gonzalez Bustamonte Rafferty), Gail Davis (Terry Muldoon), Hugh Beaumont (Brad Roberts), Mari Blanchard (Stella), George Nader (Paul Manning) Robert J. Wilke (Bellew), Cliff Clark (Terence Muldoon), Russell Hicks (Colonel Marvin), Robert Bray (Steve), Fred Graham (Joe). This time around, Tim Holt and Chito get involved with the transcontinental telegraph. Terry Muldoon (Gail Davis) and her father are running the wire westward, and its completion will close down a number of military outposts. This will destroy Paul Manning’s supply business and keep him from paying off his loans to Brad Roberts (Hugh Beaumont). Roberts and his bunch (which naturally includes Robert J. Wilke) take matters into their own hands —a “Gang-Stooge Terror Plot,” according to the ads — and eventually run afoul of Tim and Chito. Overland Telegraph (1951) is one of my favorite Holt pictures. It’s a lot of fun to watch Hugh Beaumont as a bad guy. Mari Blanchard doesn’t have much to do but look pretty as Nader’s saloon-girl fiancé. But having Gail Davis on hand is a real asset, displaying a bit of the riding and shooting skills that would make her such a great Annie Oakley on TV. The Iverson Ranch is featured quite a bit, too. Of course, director Lesley Selander and editor Samuel Beetley deserve a lot of the credit. They keep things moving at such a clip that the hour’s over before you know it. If you’ve ever seen a lousy B Western, you know that in the wrong hands, an hour can last forever. Selander is such a pro and has such a flair for these things that his films stand apart from the rest. He should’ve written a textbook on film pacing. 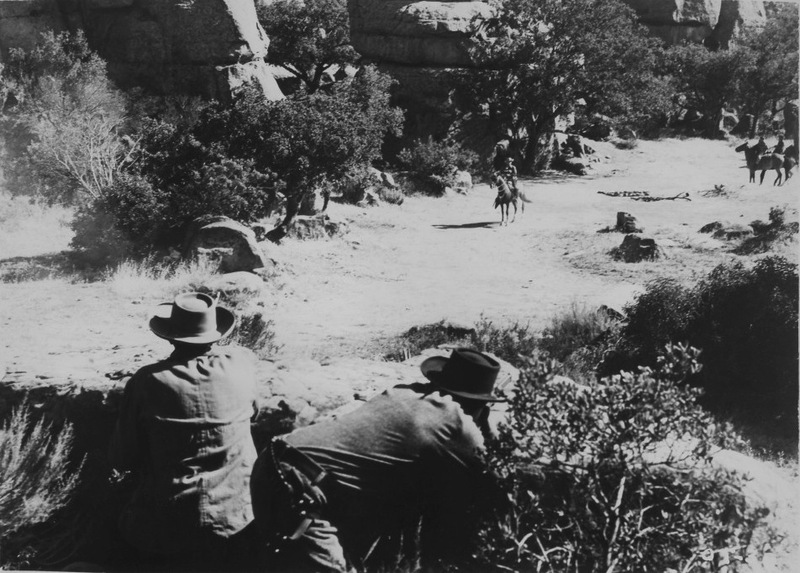 Overland Telegraph is part of Warner Archive’s fourth volume of the Tim Holt Western Classics Collection. It has several of the earlier entries and the last few, providing a great overview of the series. B Westerns didn’t come any better than these. As with the previous sets, the transfers are exquisite — a real tribute to the care and craftsmanship that went into these films. Highly, highly recommended (as if you hadn’t figured that out already). SOURCE: * Westerns Women by Boyd Magers and Michael G. Fitzgerald. “If It’s Tuesday, This Must Be….” Tim Holt Day! Another terrific little series western that is up there with the best ever made, as we have said before. Thanks for keeping Tuesdays & Tim Holt, Toby. 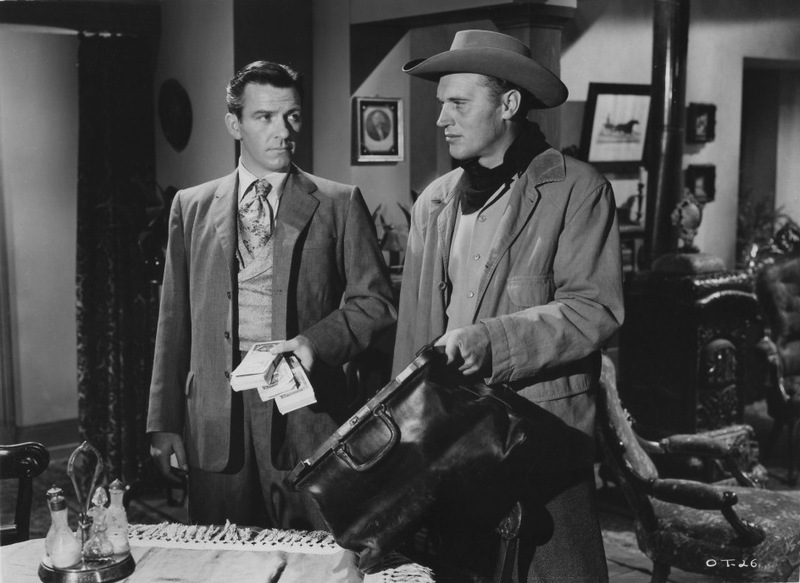 I’m toying with the idea of Wild Bill Wednesdays to cover all Elliott’s 50s Westerns. There aren’t that many, but I sure love ’em. Oh, that would be great, Toby! Wild Bill Wednesdays……..wonderful. Hope you do it. These Tim Holt reports are the highlights of the week for me. I’d go wild for Bill Elliott Wednesdays, my 2 “new” Sat. matinee cowboy favorites. I’d seen Roy Rogers and Hopalong and they are both still favorites, but Bill Elliott and Tim Holt were fairly new discoveries for me a couple years ago, they sure are up there with the best Roy & Hoppy. I watch a matinee western every week of a different cowboy star, Eddie Dean, Lash Larue, Sunset Carson, Whip Wilson etc. etc. some of them are pretty bad (sorry Eddie, Lash and Sunset, but you are dull) seeing the Tim Holts and Bill Elliotts really shows the difference between a star with style & charisma and bad actors coupled with bad scripts. I still haven’t given up watching, I may just enjoy the torture but it does make me appreciate Tim, Bill, & Roy so much more. Hi, Johnny G., we’ve not spoken in a while. I like the fact that you put time aside each week for a B-western. I agree with you that there are “class acts” and then the rest but of course I always try to remember when I watch that I should bear in mind I am not comparing like with like. Eddie or Lash at Poverty Row PRC is never going to compare favourably with a Hoppy made by Paramount or Holt made by RKO. Very different sized budgets. Like you though, I try to watch across the range of stars to get a good variety. Sunset Carson was a pretty hopeless actor but his films at Republic were slick, fast-moving and chock full of stunts. I can cope with Sunset. I thought you would be enthusiastic about Wild Bill Wednesdays. Me too!! I haven’t given up, I still continue to watch a different Saturday matinee cowboy star each Friday night, and have more Eddie’s, Sunsets & Lash’s to come. I’m going to watch them all if it kills me. I will also say that Whip Wilson was another new cowboy discovery for me and a real pleasant surprise. I really liked him a lot. Whip Wilson is up there amongst my favorites, I esp. like the ones where Phyllis Coates is his co-star. I was surprised I didn’t care for Gene Autry’s movies, since he’s one of the most famous cowboys. The good thing about his movies though is that the songs in his movies are always famous one’s that I’ve heard of before. I’m also a big Bing Crosby fan for many years and I recognize the Autry songs from hearing Bing sing them before. I’ll also credit Eddie Dean with a good voice (I like it better than Gene’s) but unfortunately most of the songs he sings I never heard of before. Guess like you say, the budget probably restricted their choice of songs. But heck, they’re all fun to watch, even the bad ones have a charm to them.